Baby Mama: 20 Months Old. Why does time move so fast? Why? Why? Why? 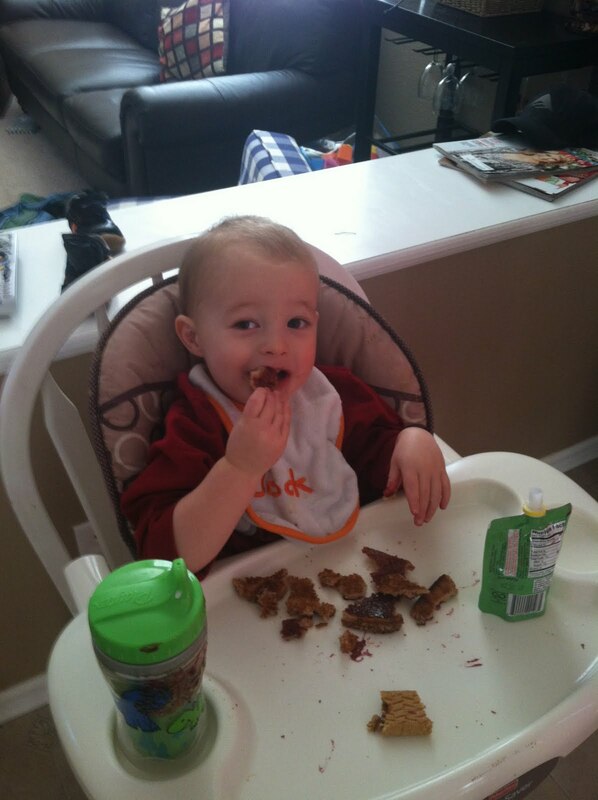 We are going to have a 2 year old in 4 short months. WHAT? How does this happen? Even though some days are hard because a certain someone is active and stubborn and opinionated, I am loving the toddler stage. He is so much fun!! Paul is talking and talking and talking. His new favorite phrase is "I need." It usually goes, "I need to shoot" and then he plays basketball for an hour. He also has started to ask questions, "Where did Mommy go?" It is amazing to me how many words and phrases he picks up in a day. I wish I could learn things this fast. The only thing he will watch on TV is basketball. 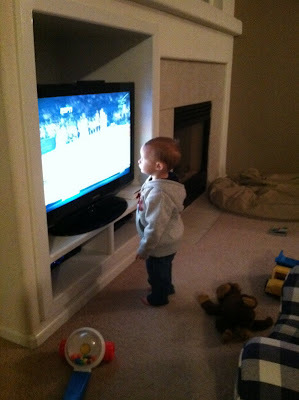 He stands so close to the television, I wonder if he thinks he is actually part of the action. He stands with his hands behind his back, studying every move the players make. And God help us when a commercial comes on. He brings us the remote and screams, "basketball." So of course we have some games on DVR so we can fast forward the commercials. I know this is not teaching him anything good such as patience, but sometimes a mom just has to do what she has to do. Paul received a sled from Santa. We had a big snowstorm before Christmas, so we broke out the new toy early and tried it out in our front yard. He was a little unsure of the sled, but I think once he gets the hang of things, he will like it. There is an amazing sledding hill right by our house and I can't wait for him to try it out. 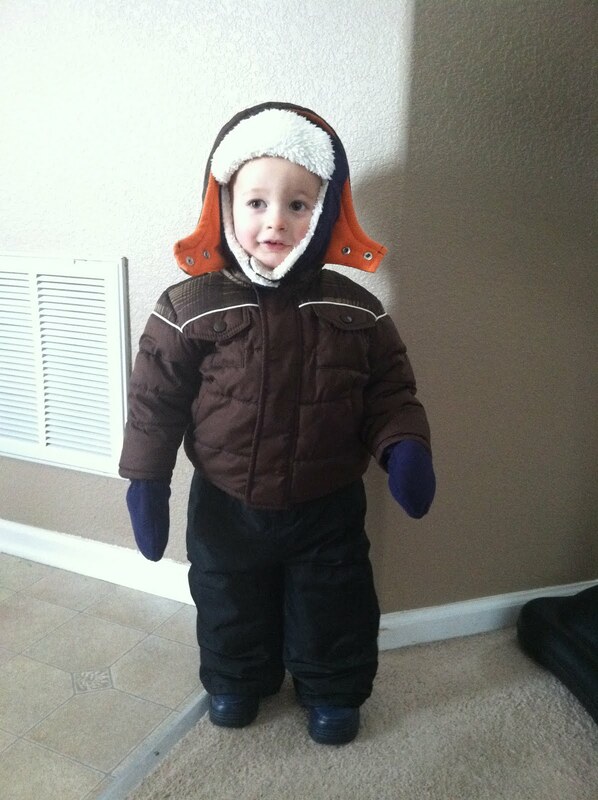 How cute does he look all bundled up? Paul usually eats pretty well, but I feel like some weeks are amazing and then the next week he wants to eat nothing. Is this normal? One day he loves bananas and the next day he feeds every single one to the dog. By the way, if we did not have a dog I would buy one immediately. Do people really sweep their floors 3 times a day if they have a toddler with no dog? We just let Diddy in the kitchen and almost instantaneously the mess is gone. He is a miracle worker. Besides basketball, Paul's other hobbies include coloring, reading books, playing pretend (feeding his stuffed monkey), playing with all his animals figurines and playing with his choo choo. He also likes to stand at our front door and run full speed back into the family room. This kind of sprinting can entertain him for some time. Paul also has some friends. Tyson our neighbor is a year older than him, and they like to race trucks down our kitchen, see who can scream louder, and have dance parties. Our other neighbor Ellie is about 6 months younger than Paul and is so cute. She is now running around with the boys and I am sure will give them a run for their money in no time. It is actually a little easier having all the kids together in one place because they entertain one another. It is louder, but at least we can finish our sentences 70% of the time, which is a huge improvement. We have had 2 weeks off from work this month, so it has been extra special to spend more time with our little dude. He has even started to give Eskimo kisses. He has also started slapping us in the face. That is not as cute. Take a little give a little. We don't have a dog and yes, I wipe the floor at least 2-3 times a day. It's exhausting! And it's getting harder with a belly. Ugh. I often wish I had a dog, but then I'd have yet one more responsibility and I have enough right now! Maybe when the kids are older. He is really cute and the basketball thing is adorable. They warn you and warn you that time flies with your kids but it's amazing to me how fast it really goes! Enjoy it. I've only met Tyson once, but I love him. The picture of him with his arm around Paul is darling. And he taught Paul to break dance. It must be a blast to see them together!